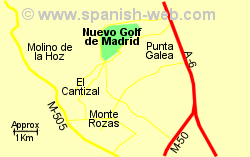 Nuevo Club de Golf de Madrid, founded in 1972, is located on a gentle hillside, 22 Km north west of Madrid city centre, beside the La Coruña road. The par 70 course has a length of 4861 to 5443m. Facilities include a golf school, driving range, swimming pool, and restaurant. 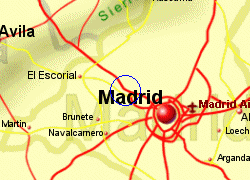 Centro Deportivo Barberan 9 holes, 10 Km south west of Madrid centre, at Quatros Vientos. 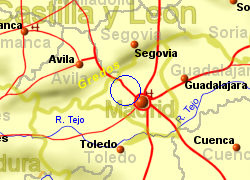 Map of the Nuevo Golf Madrid area.